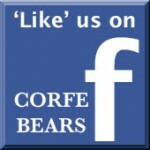 Corfe Bears is a family business, run by myself, Hayley, my husband Stace and my daughter Jade. We are assisted by Lyn, our Chief Bear Minder, who is a brilliant asset to the team! We pride ourselves on giving you an excellent old-fashioned service, taking the time to talk to you, learning what bears you like, which ones you have and generally getting to know you. Our customers become our friends and we look forward to your next visit!! You can follow us on Facebook and keep up with our latest arrivals, new product ranges and special offers.ֲ Jade looks after our Facebook page and website, along with Simon who is our technical department and a secret bear-lover! We would love you to tag us in any photos of your bears on Facebook…. our big six foot Charlie Bear who stands outside the shop seems to sneak into lots of pictures too! In stock in our shop and Bear House, we have collectable bears, animals and rag dolls from manufacturers including Steiff, Merrythought, Charlie Bears, Kosen animals and Jellycat. We also have artist bears such as Deb Canham; character cuddlies and plush animals to suit all pockets. Our baby safe collections from Steiff Bears, Jellycat and Charlie Bears offer a great choice of teddy bears, animals & comforters, safe for babies from birth and even machine washable. These are perfect gifts for a newborn or for a christening - it is often these special teddies that stay with you for a lifetime! In our opinion, nothing beats seeing the bear “in the fur” and having a cuddle. We have collectable bears made from plush, mohair and alpaca. If you are not able to get into our shop you can purchase online. We encourage you to call to discuss your requirements and we’ll happily give you advice over the phone - we have cuddled and handled the bears many times and can give information on their feel, limited edition numbers, colour, etc. UK delivery is free of charge on orders over ֲ£15 and we send out 1st Class, so you won’t be waiting long for your new addition to arrive into your hug! !